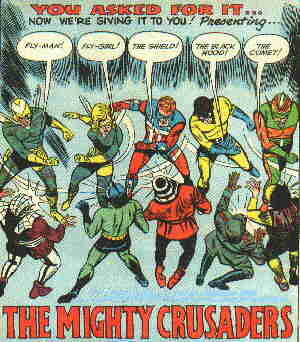 In 1983, Archie Comics launched a new superhero line — this one, called "Red Circle Comics", along more traditional lines — and a new version of The Mighty Crusaders was part of it. This incarnation of the group used all the original characters except The Comet (with The Fly having reverted to his original name), plus The Web, The Jaguar, Lancelot Strong, and a de-evilized Wizard. It lasted twice as long as the original version, but was gone by 1985. In 1991-92, when DC Comics licensed the Archie superheroes for its "!mpact Comics" imprint, DC's versions of the characters briefly formed a team of their own. This time, the adjective was dropped — they were simply called "The Crusaders". Text ©2000-08 Donald D. Markstein. Art © Archie Comics.